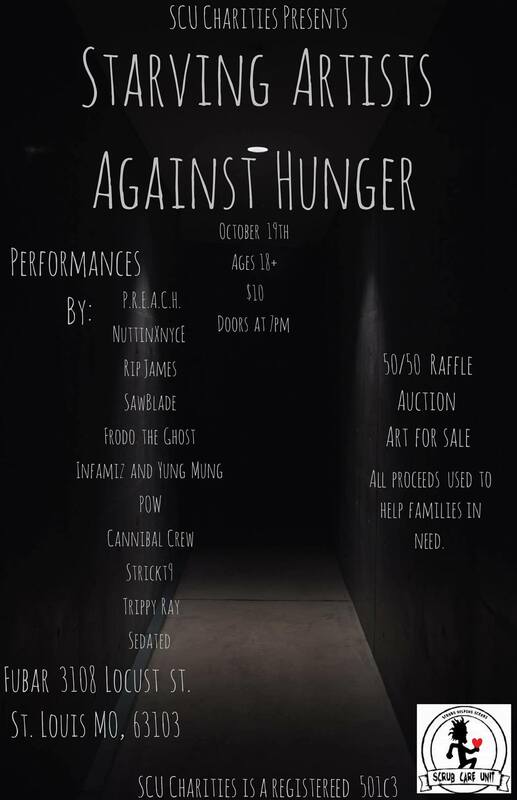 Our homies at the Scrub Care Unit have put together a charity event that’s happening on October 19th at a venue called FUBAR in St. Louis. It’s called the “Starving Artists Against Hunger” show, and ALL proceeds will go to feed families for Thanksgiving, and towards the purchase of 10 bikes for 10 kids during the holidays! There’s a full night of great music, raffles, and fun, and everything is going to a great cause! You can check the artist line-up, events, venue details, and all other info below. Proceeds going to SCU Charities ‘Feed Families for Thanksgiving” and “10 Kids/10 Bikes for Christmas”. Look forward to a night full of great music, fun, and opportunities to win cash and cool collectibles while helping to support SCU Charities’ outreach helping those in need. SCU Charities is a nationally registered 501c3 with over 7 years of helping those in need! If you’re in the St. Louis area and can make it out, don’t miss it! If you CAN’T make it to the show itself, you can always send donations to the official SCU Paypal email: ltomlin12@yahoo.com!